Building off the success of its award-winning first edition, the second edition of Crafting Phenomenological Research continues to be the leading resource for those interested in a concise introduction to phenomenological research in education and social sciences. 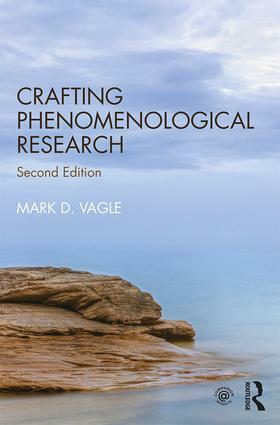 Joining leading contemporary practitioners, such as van Manen, Giorgi, and Dahlberg, Vagle walks the reader through multiple approaches to designing and implementing phenomenological research, including his post-intentional phenomenology, which incorporates elements of post-structural thinking into traditional methods. Vagle provides readers with methodological tools to build their own phenomenological study, addressing such issues as research design, data gathering and analysis, and writing. Replete with exercises for students, resources for further research, and examples of completed phenomenological studies, this book affords the instructor an easy entrée into introducing phenomenology into courses on qualitative research, social theory, or educational research. An additional first chapter that outlines the historical background of phenomenological philosophy and methodology. A feature called "snapshots" that provides brief commentary and/or examples to illustrate concepts and ideas. Updated "resource digs" providing more examples, with the addition of more international resources. What Is a Phenomenon in Phenomenology? What Is Intentionality and Why Is it Important?